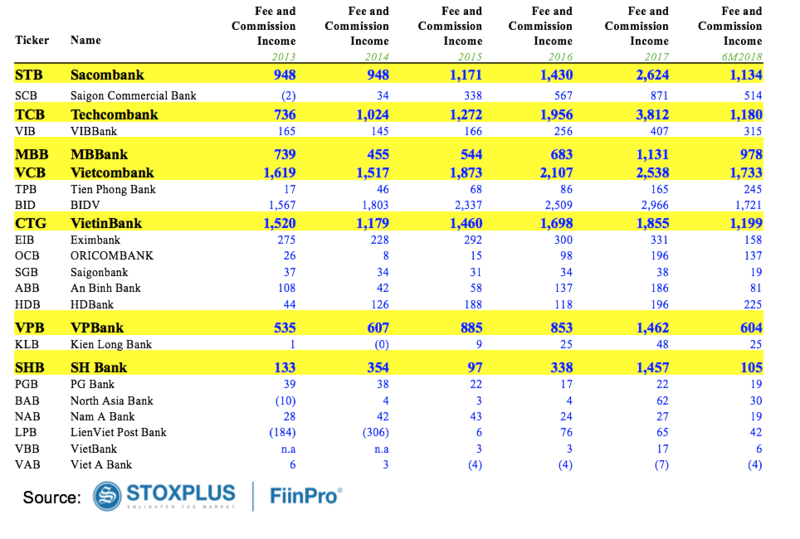 FiinPro - Are Banking Stocks Still Attractive? Banking stocks have been one of the market leading ones over the years. 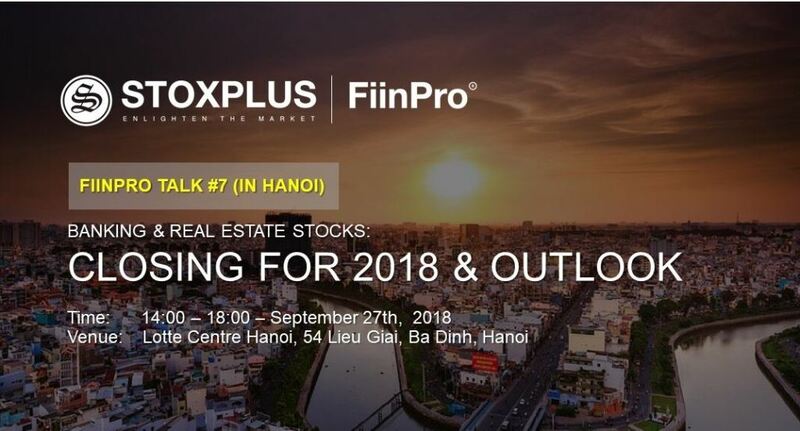 FiinPro data showed that banking stocks enjoyed a 3-digit growth for the past five years, up 154.1% versus VNIndex’s double-digit gain of 96.5%. Will the attractiveness of banking stocks remain in the last months of 2018 and in 2019? Looking back over the past three years, the banking sector has three main stories that have driven bank share price growth: (i) the story of consumer lending and, in particular, VPB and HDB; ii) booking revenue from insurance sales, typically TCB, MBB and Sacombank; and (iii) most recently the strong growth of retail banking / personal loans. What will be the story for the end of 2018 and 2019? In addition, the revenue from insurance sales will be cause a sharp increase in profit for some banks which have not implemented the service or they can re-negotiate with their insurance partners, including VCB. In fact, VCB has the largest customer database and already has insurance partners, but they are publicly open to seek insurance partners with a total value of up to $ 1 billion. Other cases are Lien Viet Post Bank and SHB. The standard structure of a co-operation contract between banks and insurance companies consists of set up fees and commission sharing. The banks can negotiate and distribute these two components to manage their profits and book set up fees in the first years as “front loading”. EPS growth in the banking sector is forecasted to continue to rise well despite the fact that banks are unlikely to reach17% credit growth cap. EPS growth is forecast at 43% by analysts’ consensus, 35.7% by management estimates and 29.9% by StoxPlus' forecast. EPS growth in 2018 would be feasible although the structure and contribution would come mainly from personal loans. The reality is that corporate lending almost stands still while credit growth is mainly come from personal loans. Consumer finance provided by more than 10 major financial companies has slowed down with CARG falling from 43% in the past five years to 6.67% in 1H2018. This is a factor that the market needs to monitor and evaluate more carefully. In fact, the SBV has some tighter management policies for consumer lending, but such sudden decline is a factor that needs to be considered in terms of the sustainability of the model and the real potential for market growth when main channels of finance companies are covered in large part. Financial companies may be looking for non-traditional channels such as online and niche products such as microenterprises and individual businesses. On the risk side, interest rate risk will have a big impact on banks’ profit from bond yields this year and is expected to be lower than 2017 as bond yields have risen more than 100 basic points from the beginning of 2018. In recent years, treasury income which mainly came from investment in government bonds contribute a big part to the bank's total income. However, in the context of rising interest rates and the fact that government bond yields rose more than 1% to 3.89% in September this would cause many banks to have their income decline or even suffer losses if their portfolio was built based on low interest rates previously. Of course, in accordance with current accounting regulations, these investments are currently accounted at cost on acquisition and recognized as interest income until they are disposal or maturity. As a result, the gain or loss on this investment will only be booked when the bank sells these investments or closes at maturity. 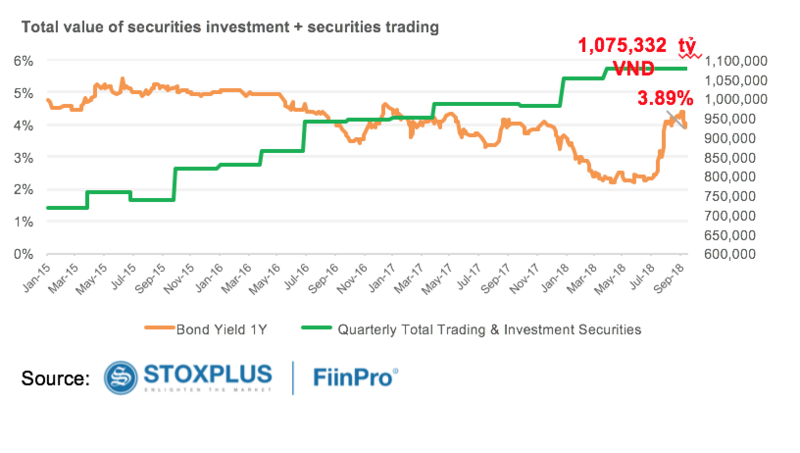 The risk lies on 25% of VND1 trillion portfolio of 19 banks with existing terms of less than 1 year and another 43% of VND1 trillion securities with terms of 1-5 years. And this could be the factor that will erode banks' profits in the first half of 2019 or the end of 2019 if government bond yields continue to stay at current levels or continue to increase significantly in the coming time. Another point is that banks’ NIM is showing signs of improvement mainly thanks to personal credit growth, which is more profitable than corporate loans and in reality it is higher than the current average of 3%. The reason was that many banks have "virtual" credit growth at the end of the quarter and specially end of the year, for example, TCB had credit growth of more than VND20 trillion in one quarter by the end of 2017. This can be explained that banks may use savings products to lend and StoxPlus data showed that the financial statements of all large enterprises indicate that no business can absorb such large disbursements in one quarter. The interest rates are basically stable from the beginning of 2018, OMO interest rates down 0.25 percentage point, interest rates on the interbank market are quite low. The stable domestic interest rates is a success in the context of fluctuating interest rates in the world market. According to the representative of the SBV, the interaction forces on interest rates are quite balanced, even the favorable factors are stronger in the current economic environment. Meanwhile, SBV will navigate he monetary policy with focuses: Stability is the most important factor; sticks to objectives, strive to exceed targets; strictly follow outside markets’ developments to timely and actively adapt solutions; tools of monetary policy; closely coordinate with other ministries and branches of the Government in macro-economic management and communication on market developments and monetary policy. 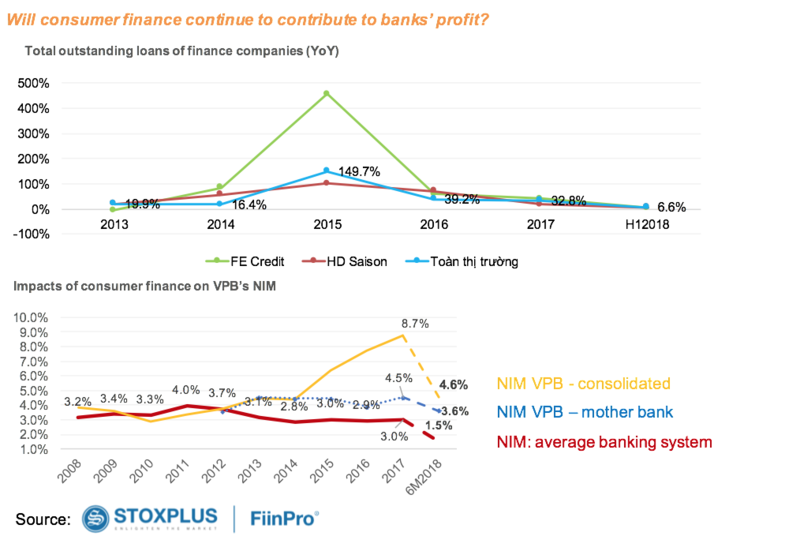 With the above-mentioned factors, participants at FiinPro Talk 7 agreed that the banking stocks will see their peaks in the first half of 2019.